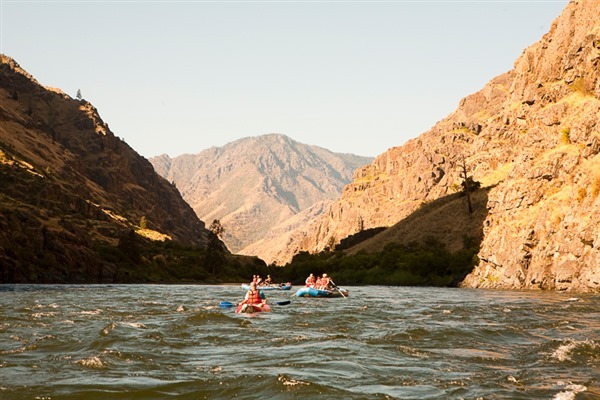 3 Day or 4 Day Whitewater Rafting Trips in Hells Canyon – the deepest canyon in North America! 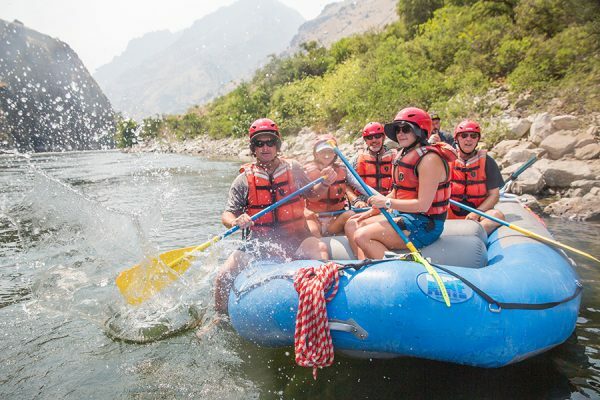 These Snake River Rafting Trips are by far our most popular! 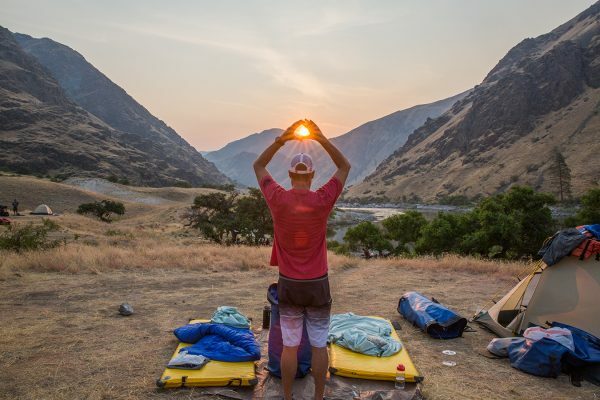 There’s nothing quite like a Hells Canyon rafting trip. From hiking the mountains to whitewater rafting, this is a jam-packed adventure you won’t soon forget. 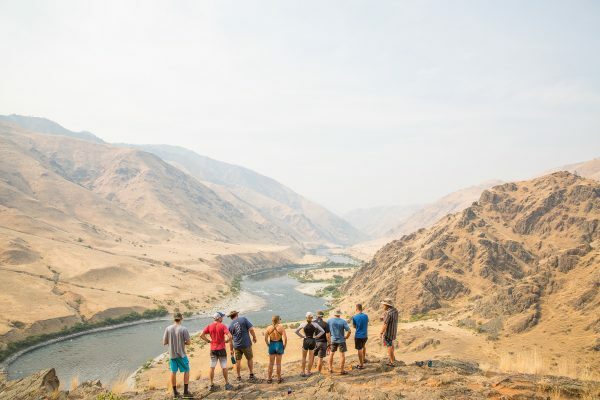 Hells Canyon is the deepest canyon in North America; it spans approximately 8,000 feet from the Snake River to the peak of the Seven Devils Mountains. If your family wants to reconnect while disconnecting from social media and busy everyday life, or if your company is looking for a unique team building experience, this is the perfect solution, and it lies in the middle of the beautiful wilderness. 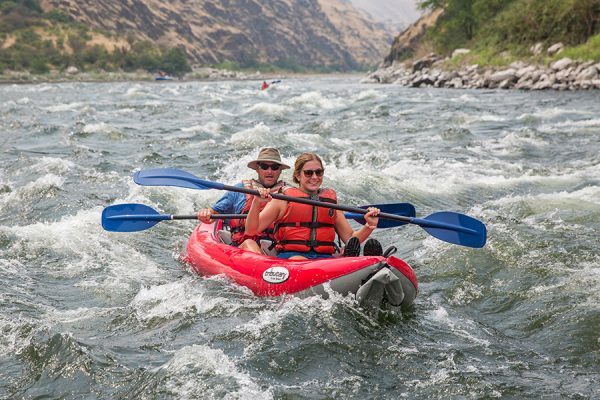 The Snake River through Hells Canyon is rated Class III-IV whitewater. It is a large volume river with drop-pool style rapids, meaning a rapid is followed by a large pool of calm water. This section consists of mostly Class III rapids with a few Class IV’s. 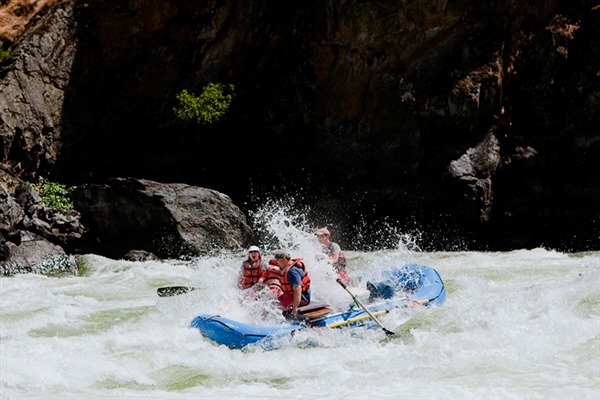 Many of these rapids are described as roller-coaster waves creating a fun and enjoyable ride appropriate for most physical abilities, including children ages 7 and up. Many boat landings are rocky and require walking varied distances on uneven terrain. 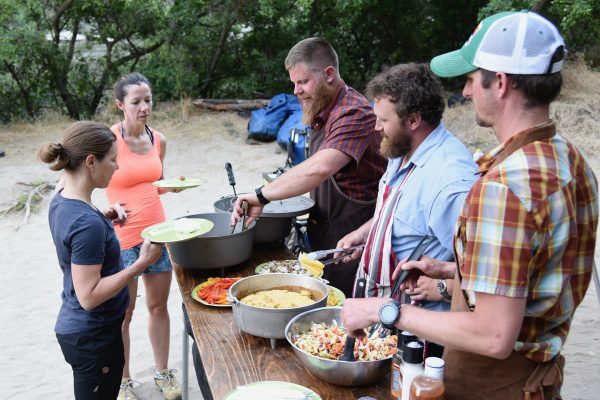 Once at camp, the terrain is usually open and forgiving. All hiking is optional and easy to moderate difficulty. Here are the boats we offer on our trips. Day 1: After an early morning departure and a scenic drive along several reservoirs, we arrive at Hells Canyon Dam and prepare to begin our river adventure. Our first day starts off with a bang with several Class II-III rapids. The trout fishing is exceptional during the first day in the swift moving water. Lunch is served riverside usually with an option for a short hike or time to relax, swim or fish. After lunch, the Class IV whitewater rapids are fun, big and splashy. In the afternoon, boats pull into camp where tents will be ready and waiting. Relaxing in camp, fishing, swimming, hiking and playing beach games is encouraged at camp. Each night a delicious gourmet meal is prepared from our river kitchen: appetizers, delicious entrées, fresh baked Dutch Oven breads and decadent desserts. Days 2-3: After sleeping under the stars, coffee will be brewing and breakfast will soon follow. Bags will be packed and boats will be boarded. Phenomenal whitewater follows with calm swimming pools, great fishing holes, rich history, tasty food, and fun. This is when the magic of a river trip happens: no clocks, no cell phones, no computers; just you, the group and your beautiful surroundings. The evening will be similar to the previous night at a camp further down river. Last Day: We arrive at the take-out in the early afternoon and head back to civilization. You can plan on arriving back to Cambridge around 7:00 pm. If you have any time constrictions, please let us know when you book the trip and we can adjust accordingly. Note for booking departing flights after the trip: There’s a lot of travel time from the river on the last day. We do not recommend flying out on the final day of a river trip. Please call or email us with questions about appropriate flight times and airport choices: 208-347-3862. Hells Canyon is usually hot and dry in the summer. Average highs are in the 90’s with some weeks exceeding 100F. The nights usually cool off with average lows in 60’s to 70’s. Bathing suits, quick dry shorts/pants, and long/short sleeve shirts are recommended for the day. Although cotton is not usually recommended on most river trips, it is appropriate and cooling during the hot days. A light rain jacket is useful for the off chance of rain or splashy rapids, especially in the early mornings or late afternoons. Protection from the sun is highly recommended. Sun hats, sun glasses, sunscreen, and long and light layers are excellent. While in the raft or kayak you should wear sturdy shoes that will stay on your feet and should be comfortable when wet. There are many appropriate varieties of boat shoes: Teva’s, Chaco’s, Keen’s, Aqua Socks, or even old tennis shoes (although they will get wet and stay wet for the whole trip). Flip flops are not appropriate in the boats. Packing another pair of shoes specifically for camp is highly recommended. These could be flip flops, sneakers, hiking shoes/boots or galoshes. Pick shoes that will be comfortable and match your level of activity. A separate set of clothes for camp is also advisable solely for comfort. Check out our packing list for more details! If you have chosen to join us for a Spring or Fall trip during cooler weather, please pay particular attention to the packing list for those seasons. Air and water temperatures are cooler and the chance of rain is slightly higher. Packing appropriate clothing leads to a warm and enjoyable trip. We hope to never use the cooler weather gear, but it’s very important to have. If the weather and water temperatures call for wet suits, ARC will provide them. We offer a “farmer John” style wet suit (one piece, long pants, sleeveless and a front zipper). As always, if you have any questions about how to pack or what to wear, give us a call at 208-347-3862. A large waterproof overnight bag is supplied per guest for clothing, sleeping gear, toiletries, etc. It can easily fit one sleeping bag and the contents of a good-sized duffle bag. This bag will be packed away during the day and should contain only items that you will need at camp. A smaller waterproof day bag will also be provided and will stay with you on the boat. It is accessible throughout the day and can contain items such as sunscreen, a warm fleece or rain jacket, chap-stick, and/or a camera. If packed and sealed correctly, your bags will stay dry under most conditions, although we do not guarantee our dry bags to be completely waterproof. In order to protect important items (such as cameras, medications, etc. ), they should be packed in dry bags or boxes inside of the dry bags we provide. Putting less valuable items (like books, playing cards, etc) in zip-lock bags inside your dry bag is also recommended. If you are planning on bringing an expensive camera, please let us know and we should be able to provide a waterproof box that will be accessible throughout the trip. Call the office for more information about properly storing and packing important items. We are happy to help! 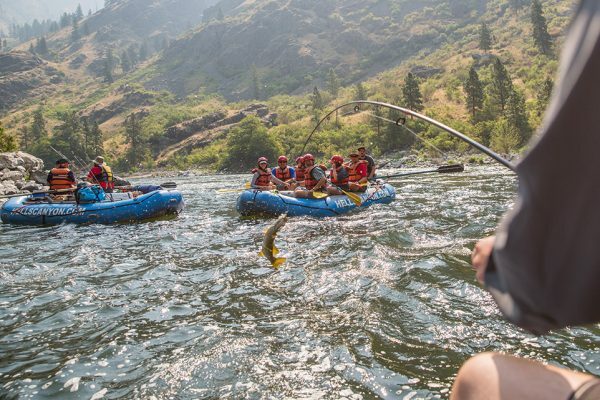 The Snake River offers excellent fishing opportunities. You’ll be able to fish from the boats throughout the day, from the bank during lunch, and in the evenings at camp. Hells Canyon runs on the border between Idaho and Oregon. You will need to obtain either a valid Idaho fishing license and/or Oregon fishing license. Either license will allow you to fish from the boat. 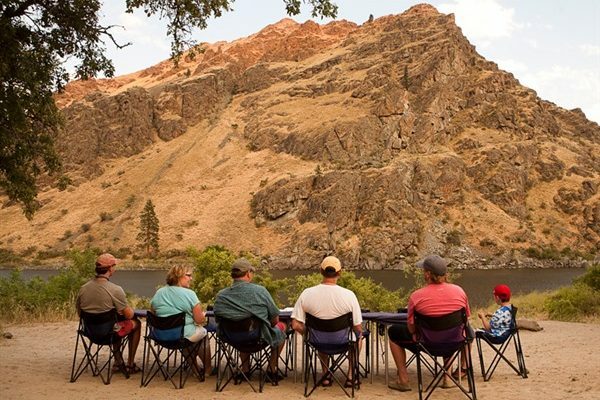 If you would like to fish from the shore at camp, we usually camp on the Oregon side and would recommend an Oregon license. Try purple, green and white poppers. Streamer patterns.